Hooray! 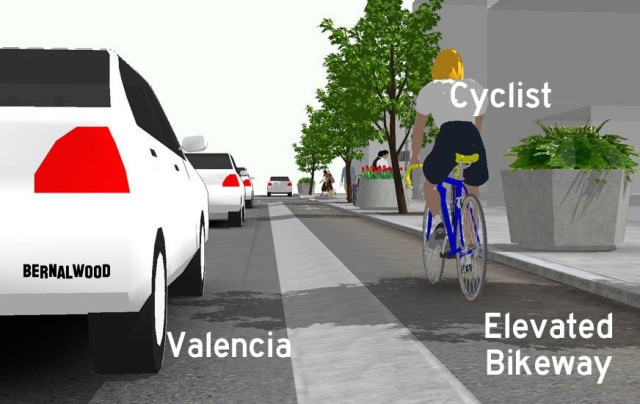 According to Bernalwood, a raised bikeway is coming Valencia Street! San Francisco is set to get its first raised bikeway next year! 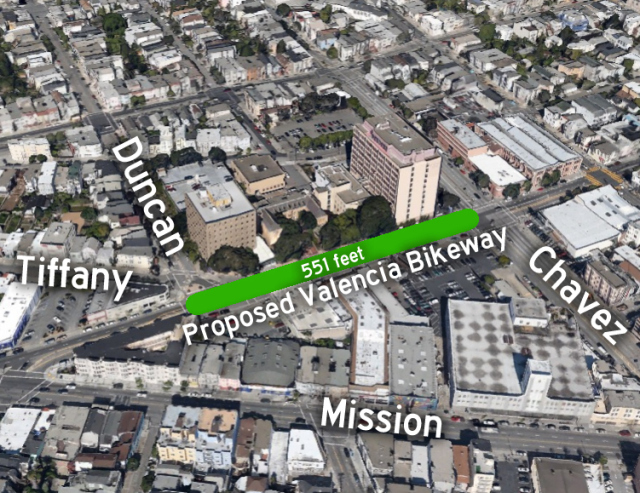 The showcase bikeway is part of the Mission/Valencia Gateway project and will stretch southbound on Valencia Street from Cesar Chavez Street to Duncan Street. This one-block bikeway heralds a completely new type of bicycle infrastructure to our city, one that will become more common in the next few years, as raised bikeways are integrated into the Masonic Avenue and 2nd Street projects. Raised bikeways are common in great bicycling cities like Copenhagen, but relatively new in the United States. Raised bikeways create a protected bikeway without bollards or barriers, instead building the bikeway at an intermediate level between the sidewalk and roadway.Learn more about raised bikeways and see designs here. The raised bikeway is an unexpected but very welcome enhancement to the Mission Valencia Green Gateway project, which wrapped up public outreach last year after three community open houses as well as feedback from hundreds of neighbors and SF Bicycle Coalition members. In addition to the raised bikeway, the final project design also includes wider sidewalks, permeable pavement and two new plazas, one at Mission and Valencia and a smaller one at Duncan and Valencia. Had the mid-twentieth century had its way, this might have been! 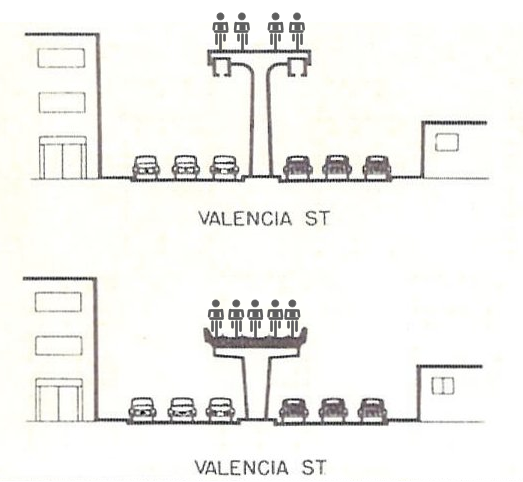 A 1956 proto-BART proposal had an elevated train running down Valencia Street! This would have obviously been abandoned and converted into a High Line West at some point. Behold the Valencia Skycycle! Of course, the Raised Bikeway is just an intermediary step towards the glory that is Valencia St Park! Valencia Street Park is an excellent idea.